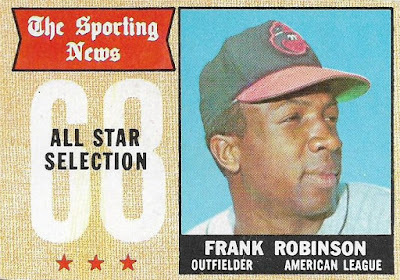 Frank Robinson wrapped up his playing career before I knew what a sacrifice fly was. He began his managing career as I was buying my first baseball cards. He played for my favorite team, briefly. And he beat my favorite team, mercilessly. He managed for all-time favorites and all-time enemies. He was an American League guy and a National League guy. I look at him as a boss, yet he was the youngest of 10 children. He was declared "washed up," right before he won the Triple Crown. He was known for being strict and ornery ... with an incredibly insightful sense of humor. Robinson struck me as someone who could play both sides of the same coin. A Hall of Fame player. A record-breaking manager. He played for World Champions (Orioles) and managed brand new teams (Nationals). He wore the uniform of the oldest franchise in baseball (Reds) and the latest and "greatest" from the '70s (Indians). He is a Hall of Famer who is still somehow underappreciated. He should be considered one of the dozen greatest players of all-time. Yet, until his death today, he's never been on everyone's lips. 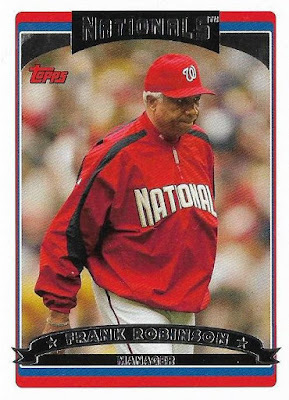 I have 39 cards of Frank Robinson. 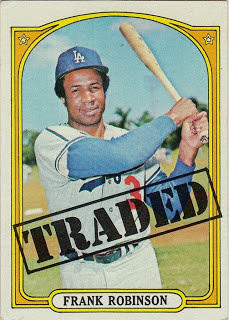 He doesn't fall neatly into my collection, except for the 103 games he played for the Dodgers in 1972. But because he somehow speaks to me -- I would never be able to find several cool cards in my collection of some of Robinson's peers -- I dug up some of my collection favorites of Mr. Frank Robinson. 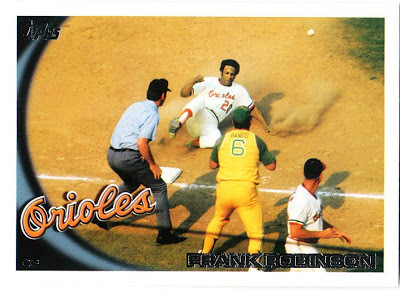 My favorite Frank Robinson card of all-time. I can only imagine what it was like to be a Dodger fan at this time and see Frank Robinson -- FRANK ROBINSON! -- in a Dodger uniform. I'm sure it took away a lot of the hurt from 1966. Not all of it. But a lot. Note to Night Owl: Just collect this set already. I'm a little surprised -- hell, a lot surprised -- that this card has never appeared on my blog. It was the desktop background on my computer at work for many months. Some athletes think it's cool to say "they never read the papers." Robinson knew that was folly. Newspapers inform. Everything else is ignorance. Robinson had the power. 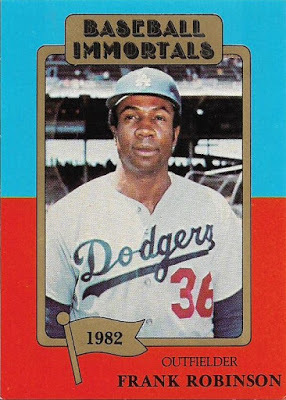 Nowhere on this card does it say "Dodgers". Not on the uniform, not on the text. Yet it's in my Dodgers binders. I dare you to say it doesn't belong. F-Robbie would never lie. Leave it to SSPC to produce one of the few cards of Robinson as a player-manager. 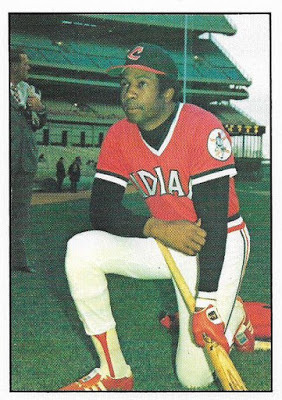 And not only that, but to show him in the glow-in-the-dark Indians uniforms of the mid-1970s. Love it. Nothing made today is as beautiful as this. The competition was so fierce in this department-- yes, the checklist department -- that I had to divide it into two categories, front and back. 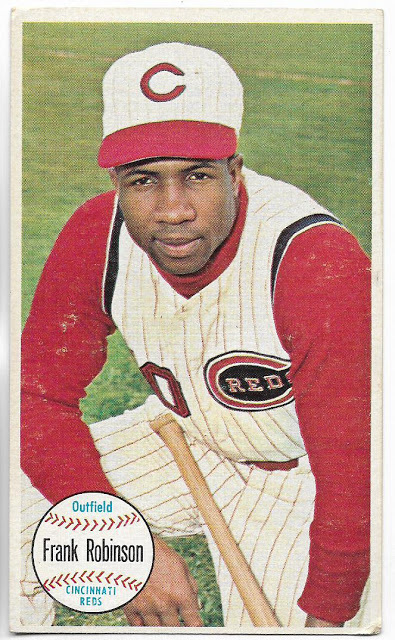 Frank Robinson is the leader of an entire platoon of hairy specimens dressed as heart attacks waiting to happen. 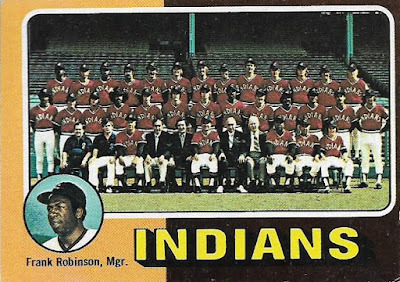 The Indians team card is actually the mini version, but let's go with one featuring just Frank. 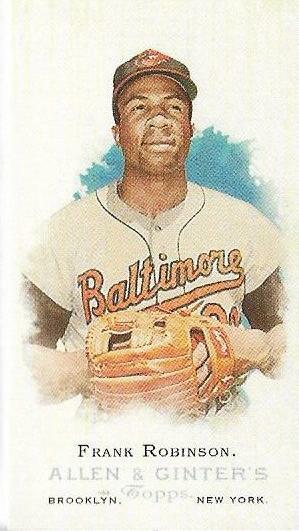 Robinson has appeared in Allen & Ginter several times, as both an Oriole and a Red. I'd like A&G to show some guts and feature him as an Indian or ... a Dodger. Seeing the 1971 design in such pristine condition is one of the most powerful moments for the All-Time Fan Favorite sets. Robinson appeared in all three editions of the set. This is my favorite. I sense some PHOTO REUSE, Topps! 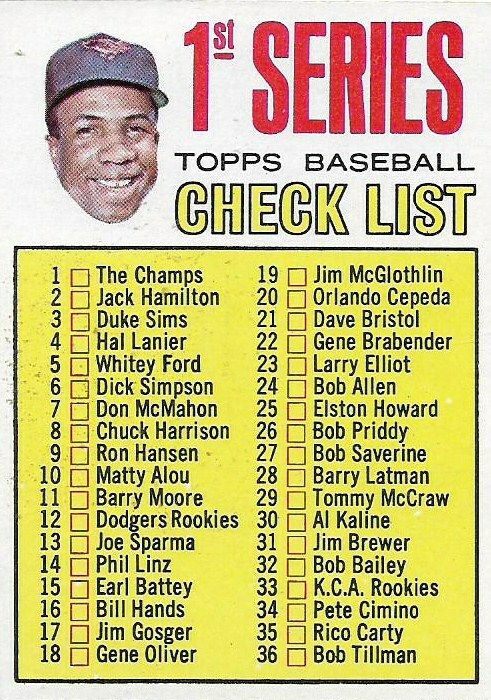 You can't question the greatness of the '68 All-Star cards. The first Robinson manager card I ever owned was his card with the Giants in the 1983 Topps set. For obvious reasons, I can't declare that my favorite. The Expos card from 2004 is an easy choice. 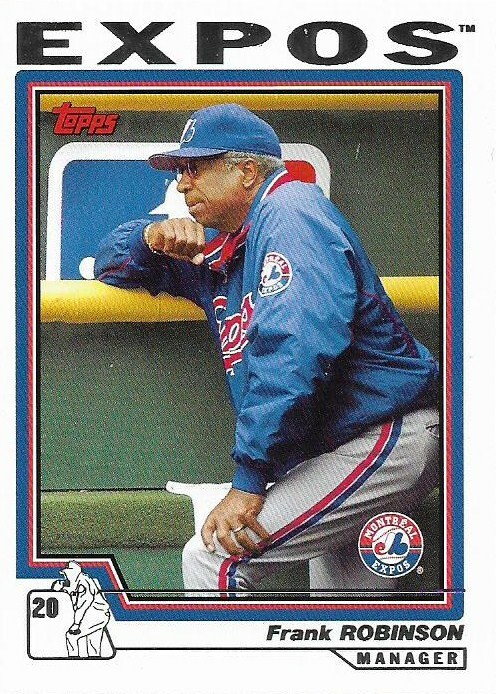 It makes me regret that the time I went to an Expos game in 2002 to do a story, I spent all my time with their opponent -- the Dodgers -- and didn't even sneak a peek for Robinson. 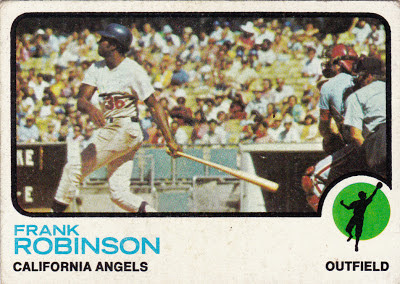 Tell me that Robinson was cranky all the time after seeing this card. There is a joke on this thing somewhere. 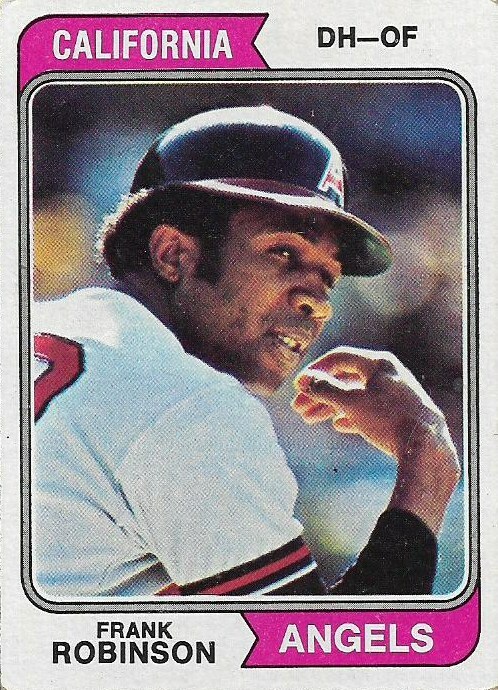 This is one of my favorite '74 Topps cards period. I pulled this short-print out of a hobby pack from a card shop that no longer exists. 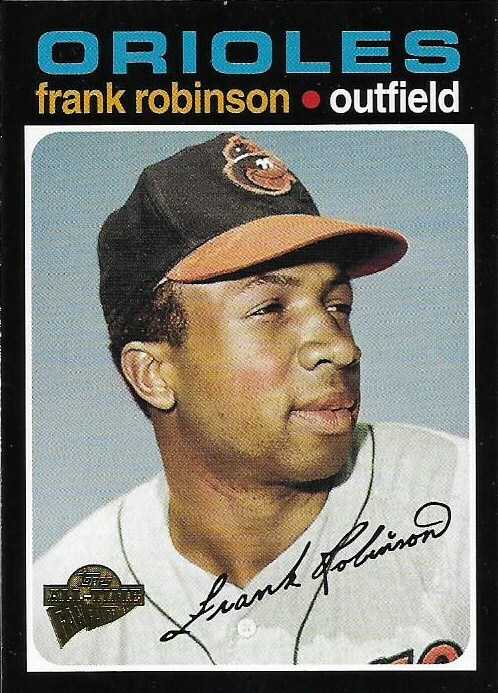 The card was traded away to someone who is a bigger Frank Robinson fan than me (I don't recall who that is). Yeah, I wish I still had it. Remember when the Nationals were new and different and nobody disliked them for stealing the Expos or collapsing against the Giants in the postseason? Yeah, you're probably right. There's always been a black cloud over the team even with Robinson leading them. Those are 15 Frank Robinson cards in my collection (well, one is no longer). I can't say I own his rookie card or some of cards from his greatest days in the '60s. But that doesn't mean I don't appreciate what he contributed. This was one of the greatest home run hitters of all-time who bunted regularly in games. He once managed a team that lost 21 straight games in 1988 and was Manager of the Year the following season. He won the Rookie of the Year, Gold Gloves and once had boxing gloves hung on the door to his office after he punched a member of his own team (pitcher Bob Reynolds), in the face, on the field, during an exhibition game. I have a feeling there will never be another player or person like Frank Robinson. Being a new Angels fan in 1973, there was not a lot of offense to cheer for - except for Frank Robinson. Thanks for the walk down memory lane. very nice tribute to one of my heroes albeit from a dodger perspective really one of the last of his era and talent. How did Joe DiMaggio get away with insisting on being called "the greatest living player" when Robinson, Willie Mays, and Hank Aaron were around? DiMaggio wouldn't even have made the greatest living outfield. Great player and agree with ned, this is a nice tribute. He was in his prime just as I got interested in baseball as a kid. At the time, he was somewhat overshadowed, as the NL all-star outfield was considered Willie Mays, Hank Aaron and Roberto Clemente. When he moved to the AL (traded for pitcher Milt Pappas), he became part of the AL all-star outfield along with Al Kaline and Carl Yastrzemski and finally started receiving some of the notice he deserved. I only have a reprint of his rookie card, but do have some of his cards from the late 50's and 60's which are highlights of my collection. Thanks for the post. Great post. I've really enjoyed reading everyone's tributes, because I seem to pick up new pieces of trivia with each one. 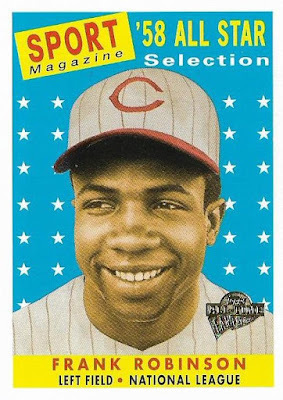 As soon as I heard the news, I thought back to my childhood to see if I could remember my first memories of Frank Robinson. I couldn't. I remember his days managing the Giants, but couldn't pinpoint the years. Obviously I remember his playing years with the Reds and Orioles, but those days were way before I started watching the game. I ended up taking a trip over to COMC (that's my goto when I need to see a bunch of cards from a certain period of time) and I'm pretty sure his 1983 Topps card was the first card I ever owned of him... although there's a chance it was his 1982 or 1983 Donruss. 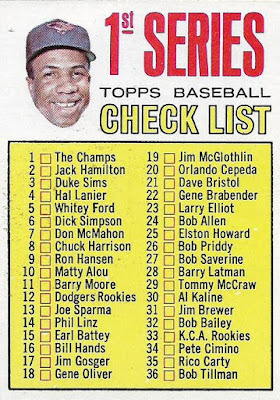 I definitely remember that cool 1983 Donruss MVP's card featuring Vida Blue, Joe Morgan, and Robinson. I'm just not sure if I owned it or if one of my friends did. That 2010 card is fantastic, and looks like there could be a story behind it perhaps. It appears Frank is ready to punch the third baseman if he tries to tag him, so the 3B is waiting for the throw --- behind the baseline. And ball cap? 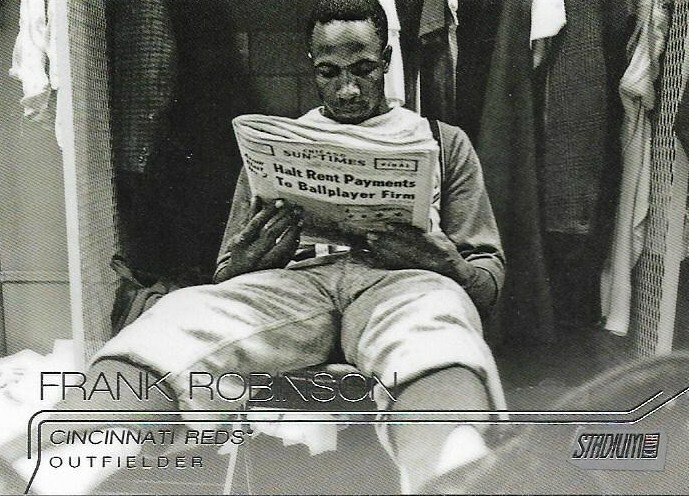 Frank Robinson don't need no ball cap!